GSEB.org has released GSEB 10th Time Table 2019 as well as GSEB 12th Time table 2019 on official website. as you all know, Govtjob2017.com is providing most important information of Gujarat Board and its Board Pariksha Plans. Gujarat Secondary and Higher Secondary Education board (GSEB) functioning under ministry of education, Government of Gujarat. The department is responsible for conducting the GUJARAT BOARD SSC public Exams/ HSC Public Examinations and a number of minor examinations. So Here We are publishing GSEB Time Table 2019. GSEB or Gujarat Secondary And Higher Secondary Education Board have declared a GSEB Result 2017 HSC October exam. This exam was conducted for HSC or 12th class. According to the press release by official gseb.org website total 111,203 students registered for GSEB HSC exam. Out of the total 104,560 students appeared for GSEB 12th exam at examination hall. Out of the total, only 16,291 students are eligible to get call letter. That means the overall GSEB result 2017 for HSC is only 15.58%. Students who want to check their GSEB 12th result can follow these steps. Click on that link and a pdf will open with the result details. GSEB Published Press Note Regarding Purak Pariksha Result of SSC/HSC Examination July 2017 on www.gseb.org. GSEB Supplementary/Re-Examination/Purak Pariksha Result Date 2017 is 31st July 2017. GSEB SSC Purak Pariksha July Result 2017 & March 2017 Exam Enrollment Certification 2017 distribution will be done on 31-07-2017 at Jill Vitran Centre from 11.00 AM to 4.00 PM. GSHSEB, Gandhinagar HSC 12th Science, Commerce & Arts Purak Pariksha July Result 2017 & March 2017 Exam Enrollment Certification 2017 distribution will be done on 31-07-2017 at Jill Vitran Centre from 11.00 AM to 4.00 PM. Candidate Can Download Below List of Result Distribution Centers given by GSEB. GSEB 12th Commerce & Arts Result Will Be declared on 30th May 2017 at www.gseb.org. Today GSHSEB Published Press Note About HSC General Stream Result on www.gseb.org. if you are commerce stream, arts/general stream student and wanted to check your result Online then you should visit gseb official website on 30th may 2017 after 8.00 am. GSEB HSC commerce Arts Result 2017 Available Now. Gujarat Secondary And Higher Secondary Education Board, Gandhinagar Will Declared 12th commerce Result on www.gseb.org | www.gipl.net | gseb.com. As we Know HSC Written Examination was held in the month of March, All Commerce & Arts Candidate are waiting for GSEB Commerce & Arts Result 2017. GSEB 12th commerce Result will be Published on tomorrow. Marksheet Distribution of Gseb General Stream aka commerce and science stream will start from 10.00 am at Jilla Vitran Sthal. Students must collect their Mark Sheet and Verify with Original Result. GSEB SSC/10th Result 2017 Declared on www.gseb.org | gipl.net. Previously Gujarat Board official Announced this Notification on www.gseb.org. As per GSEB Press Note SSC Result & Sanskrit Result Online will declared on 29-05-2017 at 8.00 a.m. Most Popular Result Website like www.indiaresults.com will display GSEB 10th / SSC Result 2017 Name wise. you can check your friends Result by Name. SSC Results will help students to take admission in 11th class in schools. they can also change their board to CBSE. There are lots of way to check result but the best way to check from official website. Every year Gujarat Secondary and Higher Secondary Education Board organizes the 12th class examinations in all of the schools of board in the month of March. For the current year also the responsible authority had scheduled the 12th or HSC examinations as per the exam schedule. Before the examinations their teachers prepares themselves for the exams so that the result of their board came into the merit list. All of the students had participated in the examinations with good preparation to attain its main aim. We all know that after 12th standard students take entry in the different colleges so that they can continue their study according to their wish. It is possible if they will get good marks in the exams. If candidates want to know when the board will announce the result. We communicate to all of the students that yet the examination checking process is work in progress so it will declare the result in the month of May. At the time of declaration of GSEB HSC Result 2017, applicants should follow the simple steps. Best of luck all of you for result. Thus you can check your performance in the examination. Must take a score card of it. Update 22th march 2017: www.gseb.org GSEB SSC/10th Answer Key, 12th Science Semester-4 Paper solution & Time Table, 12th Commerce Answer key Time Table, 12th Arts Paper solution & Time Table PDF Published at GSEB Official website. Gujarat Board 10th Standard Social Science Answer Key of Exam Date 22nd March 2017 (22-03-2017) is available now. You can Download Samajik Vigyan Answer key from This link. – Social Science Answer Key. GSEB 12th SEM 4 Maths Answer key of 20th march 2017 is also available here. Candidates can download GSEB Maths Answer key By Below Given Link. 10th standard Gujarati and Science Answer keys Are available now. You can download it from below given link. In this post you will find SSC Timetable, 11th Science 2nd Semester time table, 12th science exam schedule of gujarat secondary and higher secondary board. if you have any questions then you can ask through comment section. The Gujarat Secondary and Higher Secondary Education Board (GSHEB) was established in 1960 on 1st May. The Gujarat Board is located in Gandinagar, Gujarat. GBSE conducts main and supplementary exams every year in March and July respectively. The Seondary School Certificate Examination (SSC) is conducted in March every year for more than 9 lakh students. The GSEB is also conducts the Higher Secondary Certificate Examination (HSC). This Board also conducts following examinations on behalf of Govt of Gujarat every year or whenever needed, such as, GUJCET for engineering and medical admissions in Gujarat state & NEET . Every year a huge number of students form Gujarat state are appeared in GSEB SSC or HSC board exam. The Gujarat Board is also responsible for declaring the exam results on time. GSEB Gujarat Board has published the 10th Class march exam dates and public Examinations time table for regular and private students for the academic year 2017. The Board of Secondary Education is issued the GUJARAT BOARD 10th Class Examination Timetable 2017 in Subject wise and Board wise Dates with Timings Students who have wish to Continue their Class X of Secondary School Course at the Government and Private Schools Across in the State. GSEB 10th class 2017 Time Table download from below links. You can also read the full Gseb time table 2017 in below given table. 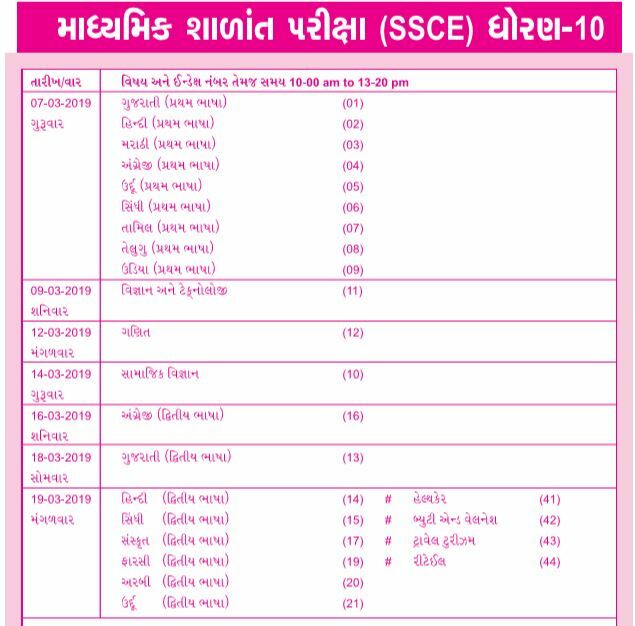 Today Gujarat Secondary Education SSC board Officially announced 10th class Examination Time table for 2017-18 academic year. Official Time table Released at www.gseb.org or http://203.77.200.35/gseb/default.aspx . Examination time will be 10.30 AM to 1.30 PM. GUJARAT BOARD 10th Class students can follow the GUJARAT BOARD 10th class 2017 Time Table, if you want ask any doubts then please comment them in comment box. 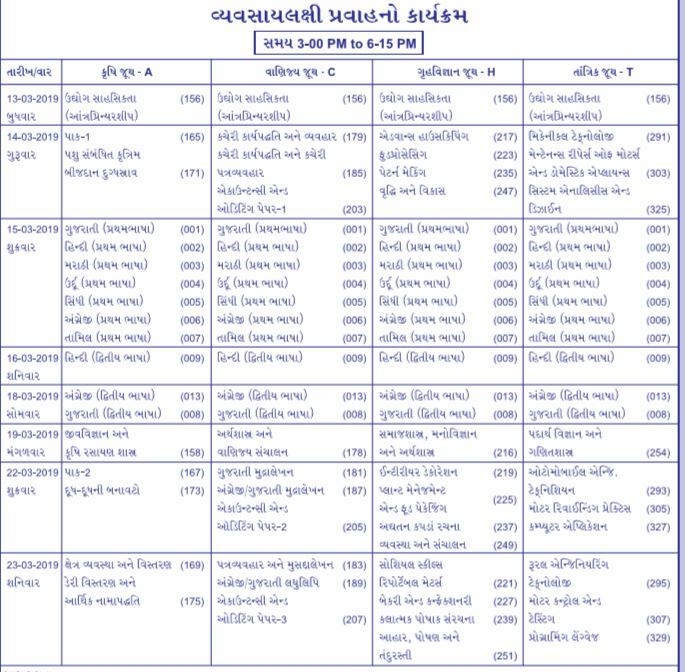 GUJARAT BOARD Secondary School Examination time table for the year 2017 Given Below. 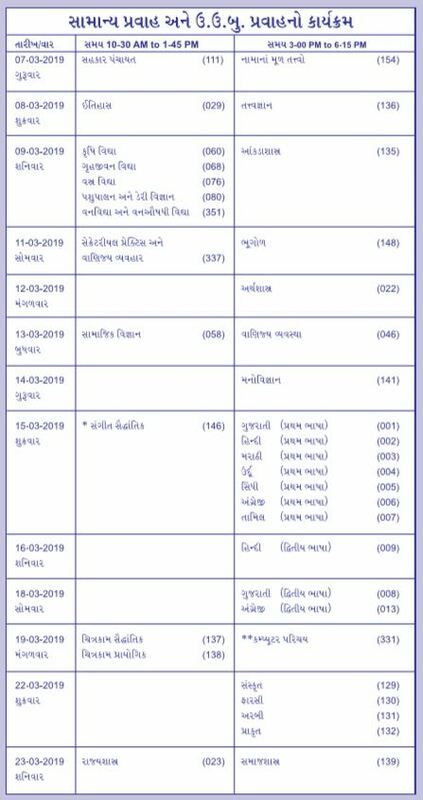 GUJARAT BOARD 10th Class Exam Schedule available here. GSEB will Soon declare 10th/SSC Result date on www.gseb.org. As Per Reports GSEB Gujarat Board Will Likely to be declare 10th Result on 6th June 2017 (06-06-2017). GSEB will conduct lots of examination of gujarat board in year 2017. So The GSEB Exam Time table is very much needed to do preparation in right manners. If you want the pdf of gseb time table 2017, then we also have that one. you just need to inform us by commenting down. there are lots of candidates who helped by us. So feel free to ask questions about Examination and gseb time table 2017.
the 11th science semester 2 timetable of gujarat board has been released. so candidate can download this time table image from below. 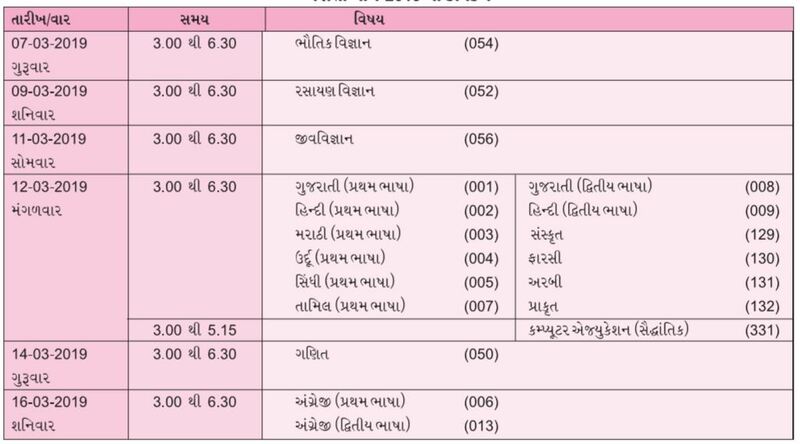 if you want some extra official information about sem 2 time table then you can go to the official gujarat higher secondary board examination website gseb.org. Amdupura naroda rod g c s hospital torrent ni shame ahemdabad . I want the pdf of gseb timetable. Where are 12th general results date….? I want pdf of time table for english medium. wher is you email id.? sir,plzzzz provide us 12 comm tmetble.. Please provide PDF hsc 12th std commerce computer answer key 2017 set D on my email address. I want to recheck my chemistry paper. You are displaying that results are on 19th but still its not available on tge official site. Please declare the relevant information. I have given SSC Exam, in that I have chosen an incorrect Question Set No. But managed to write a right Question Set No. In OMR SHEET and now I am worried about my valuable marks of my ENGLISH Subject MCQS……… Please inform me what to do in such circumstances……..
Or you are asking the same question?